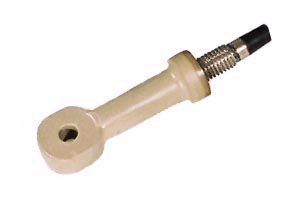 The Rosemount Mechanical and Manual Valve Insertion Assemblies are available for use with the Model 228 Toroidal Conductivity Sensor for processes where the measured solution tends to coat, plug, or abrade the sensor. The Rosemount Mechanical and Manual Valve Insertion Assemblies are available for use with the Model 228 Toroidal Conductivity Sensor for processes where the measured solution tends to coat, plug, or abrade the sensor. These assemblies should be mounted in a main process line, allowing sensor isolation for cleaning or replacement without expensive bypass line piping. The Mechanical Insertion Assembly features a unique lead screw and clamp design permitting insertion and retraction of the sensor up to 295 psig (2036 kPa abs) and 392°F (200°C). Rugged, chemically resistant 316 Stainless Steel materials of construction withstand the effects of many corrosive solutions. The sensor can be cleaned without removal from the assembly by using a wash solution through two flush ports in the retraction chamber. Alternatively, differential high pressure flow into one of the ports exiting to the process line will establish a vortex washing action.